Cheers and applause erupted at NASA's Jet Propulsion Laboratory on Monday as a waist-high unmanned lander, called InSight, touched down on Mars, capping a nearly seven-year journey from design to launch to landing. The dramatic arrival of the $993m spacecraft - designed to listen for quakes and tremors as a way to unveil the Red Planet's inner mysteries, how it formed billions of years ago and, by extension, how other rocky planets like Earth took shape - marked the eighth successful landing on Mars in NASA's history. "Touchdown confirmed," a mission control operator at NASA said, as pent-up anxiety and excitement surged through the room, and dozens of scientists leapt from their seats to embrace each other. "It was intense and you could feel the emotion," said NASA administrator Jim Bridenstine, in an interview on NASA television afterward. Bridenstine also said President Donald Trump and Vice President Mike Pence had watched on television and called to congratulate the US space agency for its hard work. "Ultimately, the day is coming when we land humans on Mars," Bridenstine said, adding that the goal is to do so by the mid 2030s. /applause - Imagine the culmination of 7 years work and not knowing until that moment if all worthwhile. 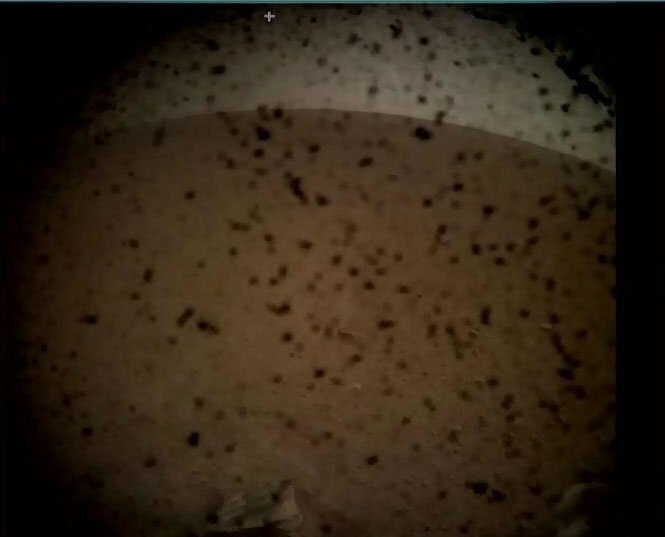 First photo taken by the mars lander. Like wondering if this is the night your boyfriend proposes. She sacrificed a lot for this idiot. Like wondering if this is the night you boyfriend proposes. She sacrificed a lot for this idiot. How long was the trip from Earth to Mars? Launched 5 May, so a little over 6.5 months. InSight is on its way to Mars, moving away from Earth at a speed of 6,200 miles per hour (10,000 kilometers per hour). Mission navigators have been tracking the spacecraft almost continuously since launch. The team adjusts InSight's flight path several times during cruise to make sure that it is flying at the right speed and direction. Six such adjustments are planned during the almost seven-month trip to Mars, as are two back-ups. The first adjustment to InSight’s flight path was completed on May 22, 2018, just 17 days after launch. I'm amazed at how the two little MarCO satellites were able to keep up after the 6.5 months, or were their courses also corrected quite often? The Insight probe's efforts to drill down below the surface of Mars appear to have hit some stony obstructions. The US space agency lander's HP3 "mole" was designed to dig up to 5m into the ground and began burrowing last week. But controllers back on Earth called a halt to operations when no progress was being made despite repeated hammering. It penetrated to a depth between 18cm and 50cm into the Martian soil with 4,000 hammer blows over a period of four hours, explained Tilman Spohn, HP3's principal investigator from the German space agency (DLR). "On its way into the depths, the mole seems to have hit a stone, tilted about 15 degrees and pushed it aside or passed it," he added. "The mole then worked its way up against another stone at an advanced depth until the planned four-hour operating time of the first sequence expired." The location was chosen after extensive study from orbit indicated the soil in the area might be deep with few sub-surface obstacles. But the presence of hidden rocks was always a possibility, and even expected. Tests back on Earth prior to the mission getting under way demonstrated that the mole could handle coarse gravel and, given plenty of hammering time, even move larger stones out of the way. So this stoppage is by no means the end the matter. So just send Bruce Willis and his drill crew. Put men on Mars? Shouldnt we aim smaller like the moon? Oh no ,they destroyed that tech and lost all of the documents.